Recover cells from your Cell-Mate3D™ cultures. Enzymes break down the Cell-Mate3D™ matrix at a physiological pH, releasing cells for downstream applications. 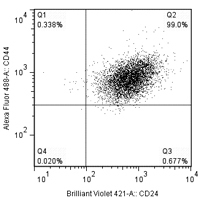 Violet 421 antibodies and analyzed by Flow Cytometry. 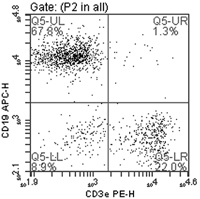 CD19 APC (B cells) antibodies and analyzed by Flow Cytometry. Viability will vary depending on cell type and duration of culture. 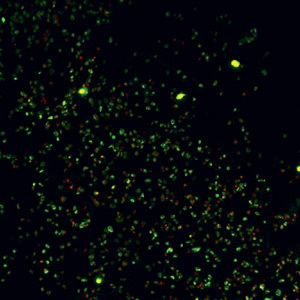 HeLa cells were isolated from Cell-Mate3D™ culture, stained with Calcein AM (live-green) and Ethidium Homodimer 1 (dead-red) and imaged using confocal fluorescent microscopy. In this case, viability was greater than 80%. Isolate cells from your Cell-Mate3D™ cultures for downstream applications such as flow cytometry or culture maintenance. thawed for later use. Vials are single use only. Viability should be assessed using Calcein AM and Ethidium Homodimer 1. Trypan staining is not suitable for use after cell retrieval because Trypan stains trace amounts of matrix material on the cell membrane. 1) Formerly Invitrogen/Life Technologies brand. Prepare the Enzyme Dilution Buffer: 1mg/ml BSA in PBS. 1. Reconstitute Enzyme Blend in 1mL of enzyme dilution buffer. filter. Allow solution to equilibrate to room temperature. After 3 minutes, gently break the matrix apart with the pipette tip. Repeat every 3-4 minutes. After 15 minutes, pipet up and down repeatedly until the majority of the matrix goes into solution. Some small fragments may remain. 4. Place the cell strainer onto a conical tube and transfer the cell-matrix mixture onto the cell strainer. 3 mL of media or PBS to wash the well of the 24 well plate and pass through the cell strainer. 6. Pellet the cells at 120G (or speed required for your cell type) for 5 minutes. 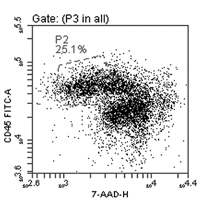 Flow Cytometry, filter samples before analysis to prevent clogs. 1. If experiencing excess cell death, shorten the incubation period to 10 minutes and/or use gentler pipetting methods. 2. If using a smaller Cell-Mate3D™ matrix piece, digest at a ratio of 1:8 matrix to diluted enzyme solution. filter and can be collected off of the filter top for further treatment. 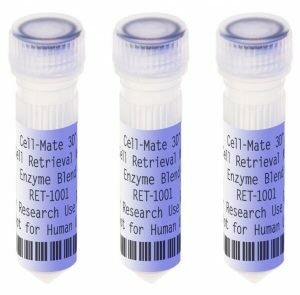 Each Cell Retrieval Kit Contains 3 tubes of enzyme blend. Vials are single use only.